Preheat oven to 375 degrees and generously oil an 8 ½ x 11 casserole dish (use Garden Fresh Gremolata EVOO or spray). Heat Garden Fresh Gremolata EVOO in a medium-sized saute pan, and saute onion until soft. In a large bowl toss bread cubes with sautéed onion and Seneca Seasoning until well coated, and gently stir in ¾ of the feta cheese. Fill casserole dish with bread mixture. In a medium bowl beat together milk, cream, and eggs. Pour cream mixture over bread. (It’s okay if the bread sticks out of the custard on top- this will make the bread crispy!). Bake 40-55 minutes or until a knife inserted in the middle comes out clean. 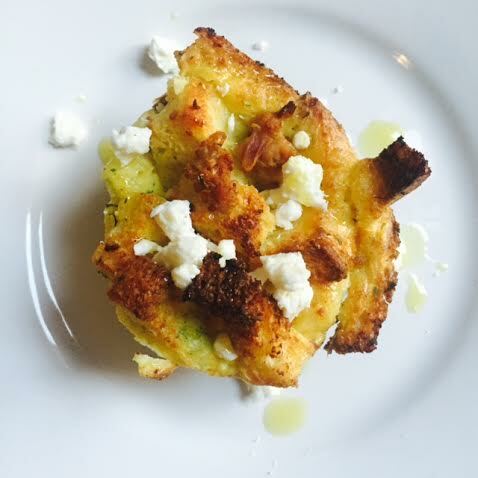 To serve drizzle with Garden Fresh Gremolata EVOO and sprinkle with remaining feta cheese. 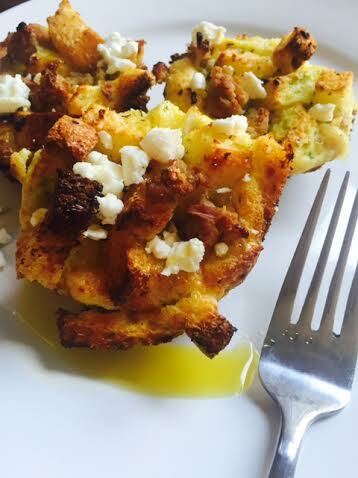 For a more elegant brunch option, fill muffin tin ¾ full with bread mixture. Pour cream mixture over bread in tins. Bake at 375 degrees for 30-45 minutes or until a knife inserted in the middle comes out clean. Optional: add browned ground turkey or breakfast sausage to bread mixture before adding to casserole. This entry was posted in Blog on May 1, 2016 by Zack Fisch.